My name is Ramon Castellanos and I currently live and work at Wild Spirit Wolf Sanctuary located in the New Mexico high desert. I was born and raised in Miami Fl. As fate would have it, my childhood and early adulthood have not been conventional in some ways . In childhood my household was a “spiritual” house, one in which the predominant religion was Santeria, which is an Afro Cuban mixture of African deity worship that involves animal sacrifice and intense ritualism. It traveled with the slaves from Nigeria to the Caribbean. My grandmother, who raised me, was a “high priestess” or “madrina” in this tradition. I was initiated into this at a very young age, perhaps too young; I was a year and a half old. So I suppose as a result of being so young and impressionable and witnessing such a complex array of magical practices, it me left me predisposed to spiritual experiences for the rest of my life. I also experienced a very sickly childhood and adolescence. At thirteen years of age it was discovered that I was born with a flat pituitary gland (the master gland), medically referred to as an empty sella; on top of that I also had gotten pretty obese. The combination of a flat pituitary and the hormonal suppression caused by obesity, made it so that puberty process was not “starting” and so under the guidance of an endocrinologist I underwent testosterone replacement therapy. However at the time I did not know that TRT at that young age and flat pituitary gland would predispose me to hormonal issues later in life. At about age 16, I started becoming more and more aware of physics, animal rights and philosophy. One day looking at photos of great mother archetypes, I had a flash of insight and decided to separate myself from the religion I grew up in, seeing it at the time for the fear based misrepresentation of African spirituality that it was. Shortly after leaving that religion, a different spiritual journey began. I started meditating daily and began exploring eastern spirituality. Shortly after that major life transition, I got really heavy into Crossfit and Parkour . My spiritual life which was once in the realm of distant judgmental gods was replaced with mental and physical training. However not knowing what I now know about these disciplines ended up destroying me….. later I would learn it was so that I could be rebuilt. My training of Parkour and Crossfit left me pushing the envelope with high intensity training pretty much daily. I tend to be an extremist, so I gave it everything I had with absolutely no knowledge of my preexisting physical compensations or even the slightest clue about what healthy biomechanics looked like. So horrible joint pain and burnout was the result of this. Compounded with the battering of my body, I also experienced a very destabilizing spiritual transformation. 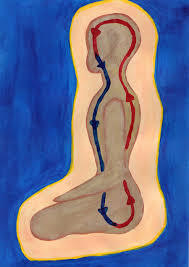 Early in my meditation process I came across an audio disk related to Daoist meditation and the “microcosmic orbit”, which is a vertical loop up the back and down the front, connecting the two main yin and yang channels of the Chinese meridian system. The only thing is that I misunderstood this powerful ancient practice and began doing it incorrectly, pushing energy into my head and leaving it there. Normally you bring the energy back down and leave it in the abdomen or lower dantien. Little did I know that by performing it incorrectly, what I was actually doing was messing with a type of practice meant to raise the Kundalini or “Shakti” energy up through the chakra system. After a few months of this practice, I began to experience really uncomfortable symptoms; feelings of unease, general malice, intense anxiety, outburst of anger, spontaneous spinal contractions, unhappiness, depression ect.. I could not figure out what was going on, but I kept meditating daily; I figured that whatever was going on would be solved by more meditation. I was still training hard and started to add OSHO’s Dynamic Meditation to the mix. One day during a particularly deep meditation I experienced an incredibly powerful explosion of spinal contractions that literally threw me from my mediation cushion. It may have lasted a whole minute or two, almost like a seizure. The immediate weeks after that experience were a blur but I was in the throes of an incredibly destabilizing catharsis. Weeks on end of crying, releasing, feeling, understanding, terror, dreading and blissing out were the order of the day for what must have been two or three months straight! I was practically useless at the beginning; I couldn’t go to school, couldn’t train and I basically couldn’t interact with the outside world. Kundalini requires a lot of physical resources and could be looked at as a form of severe stress, that can last for months and years. Also called the dragon fire, or the lighting path, Kundalini can and will fry your system if you do not know how to integrate the energy. Unfortunately many who teach about or claim to have activated Kundalini have no real understanding about what they are talking about, though I think that for many that it is not a matter of intentional deception, just a lack of knowledge. In the end, the main factor that determines whether or not someone actually experienced Kundalini, is whether or not it took over their life for a period of time and that their existential experience of the world was ignited in an all-consuming spiritual fire. Time went on and I did my best to integrate this experience. Even though spiritual growth was still at the forefront of my experience, my passion and obsession became understanding what happening to me on a physical level and healing my body. I started focusing on healthy movement patterns, corrective lifting, Paleolithic nutrition and various heart based meditative techniques. At age 18 I was still very much doing my best to get a handle on the my situation and internally struggling while remaining externally functional, I got married to my high school sweet heart (who stayed by my side during Kundalini) and moved to New Mexico to live with and finally get to know my father. The situation with him did not work out and after 6 months, my wife and I were living on our own. I got a job working customer service for Direct TV. The stress of the work and the extreme dislike I had for it, in some ways put me deeper in the hole. Even though I was still training, meditating, eating well and learning , the best that I could do was keep my head above water. The momentum from childhood illnesses, kundalini and a soul sucking job was taking its toll. I was even starting to lose my hair and I was only 20! After two years there I got into the electrical union, which was an enormous change for me because I had never worked with tools and barely knew what a drill was. I learned some interesting things but the need to constantly be away from home, living in a depressing little town and being around individuals who I did not connect with caused me to leave the job. Through a very synchronous set of events and awesome timing, I ended up once again working for my father, though this time it was two hours into the Zuni Mountains in a place called Candy Kitchen, which is located in the high desert wilderness of New Mexico at 7500 ft. elevation. He opened a convenient store right across the street (dirt road) from Wild Spirit Wolf Sanctuary. After three weeks of working with my father and having him threaten to punch me in the face over cutting a tomato incorrectly, I simply could not be there any longer. I was in a jam though because we had spent all our money to move out to this extremely rural area and had none left to get out again. Barley having any trade skills and not sure about what to do, I took it on faith that it would work itself out and I took the leap. If it turned out badly we could have become destitute. As fate would have it though my wife and I both got part time positions at the Wolf Sanctuary and perhaps the most difficult part of my life until then had begun! For me Wild Spirit became a sanctuary and a crucible for growth. Tucked away in the mountains, completely separated from society and working every form on construction in the unforgiving elements can completely transform you. There can be a coming into your body through labor. Another interesting aspect was the 24/7 living in the energetic vibrations and howls of wolves, coyotes and dingoes. My instinctual sense of this is that that these primal sounds can awaken a deep relationship to the wild world. It is here that my purpose in life became clear and the will to pursue it awoke. The physical demands of the job were almost unbearable at first, but due to a lack of distraction, the healing effect of wild animals and a reconnection to the natural world, my physical and mental practice truly began to flourish here. Instead of barley keeping myself afloat I began to truly heal. I put on 20 pounds of muscle without trying to. Through research and experimentation my hormones are healthier than ever, despite many setbacks. My study of movement has gone from a rehabilitative focus to a “primal” focus and a reactivating of the human movement code. It here that I learned that we need not try to “fix” ourselves because vitality is a birthright, what it requires is a simple unlocking. I came to understand the very literal reality of being an animal and a creature of the earth. It is here in the harsh high desert wilderness at 7’500 elevation living with wolves that my concept of Healing the Human Animal and primal movement as spiritual practice came to be.